image 2018 Lutron Electronics Co., Inc.
Q1: What is RadioRA 2 ? RadioRA 2 is a whole-home dimming system that uses radio frequency communication. It manages and monitor house lighting for security and energy savings. RadioRA 2 sets the mood for daily activities by recalling lighting scenes. It uses radio signals RF for communication, which means the system is installed without any additional wiring. Q2: How big of a house can RadioRA 2 cover? Lutron modeled a "worst case" home, including construction techniques such as cement, metal studs, stone walls and foil wrap. It was determined that in this worst case, a conservative range for the RadioRA 2 RF signal repeater is 30 feet. Assuming the average height of a room is ten feet, a repeater could cover six floors (three floors above the repeater and three floors below it) or a 60 foot diameter sphere (30 foot radius). The coverage area of a repeater is approximately 2,500 square feet per floor.Using 5 RadioRA 2 repeaters, you could cover a floor as large as 12,500 square feet. Q3: What types of lighting can RadioRA 2 control? Q4: Can I upgrade/expand my existing RadioRA 2 system? Q5: Can I control my window treatments with RadioRA 2? Yes. RadioRA 2 has a Sivoia and Sivoia QED control (RA-SVC-) which wires directly to the electronic drive unit. AC shades are also controlled using a RadioRA 2 switch and a relay. The wireless battery operated cellular shades are amazing, they install anywhere and are easy to link with the RadioRA 2 system. Perfect for windows where wire can't be run. Q6: Can I control my RA 2 system from my cell phone, or iPad ? Yes. The RadioRA 2 system can be controlled by a programmable remote and by your iPhone, iPad and Android. You will need the connect bridge and the free app. Q7: Can I activate my lights from my security system? Yes. The new RadioRA 2 visor receiver has a security contact closure inputs, which allow your security system to activate your lighting. Typically, interior lights are programmed to turn on to full brightness, and exterior lights flash to attract attention upon security system activation. RadioRA 2 devices will be "locked out" whenever the security system is activated, so that lights may not be turned off from dimmers or master controls. Q8: Can RadioRA 2 control my lights when I'm not home? Yes. The main RadioRA 2 repeater has a built in astronomic time clock, lighting changes can be activated based on time of day, sunrise, or sunset. With the built-in "away" mode, lighting changes can be scheduled to occur while you are away, making the home appear occupied. The "away" mode also uses random time shifts from day to day to simulate a more natural schedule. Q9: What can the time clock do for my system? The built in astronomical time clock in the main repeater can activate scenes at specific times of day, or relative to sunrise and sunset. Use the RS-232 port and contact closure inputs for integration with third-party devices and automatically set your lights any time. Ideal for holiday lighting. Q10: Could devices in my neighbor’s homes interfere with my RA 2 system? Q11: What happens to a RadioRA 2 system after a power outage? RadioRA 2 has non-volatile memory, which maintains all system addressing and master control programming during a power outage. After a power outage, the memory restores all system lighting as it was before the power failure. Q12: Can lightning or power surges harm RadioRA 2 in any way? RadioRA 2 devices use sophisticated protection circuitry to help guard against lightning and surges. While it is true that nothing will survive a direct lightning strike, RadioRA 2 will remain unharmed by normal electrical storms and static electricity. Q14: Where do I install my RadioRA 2 devices? All RadioRA 2 devices must be within 30 feet of a signal repeater in any direction, including up and down. (This does not include accessory dimmers or accesory switches. Multiple repeaters are used to cover larger areas. The RadioRA 2 repeaters can be placed under sofas, in closets, or on top of furniture in order to reach all devices on different floors. Repeaters must be within 60 feet of each other. Q15: How do I program my system? Q16: What would be typical master control programming? 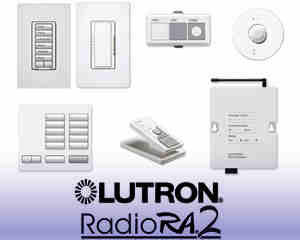 Lutron master controls can activate a single light or a group of lights. You would typically program master control buttons to work with your daily activities. For example, if you always turn on the same set of lights when you enter your home at night, you could set up a single master control button in the entryway to turn on all of these lights, instead of walking around to each dimmer. Or, if you like the lights in the family room to be a certain way for viewing movies, with some lights bright, some lights dim, and some lights off, you would program a single button on a master control to make all of the lighting in the room go to this "scene" when pressed. Buttons can also be set up to monitor a group of lights. A button can be programmed such that if there are any lights on in a particular "room," the LED beside the button will be on. Q17: Can I reduce "wall clutter" with only master controls on the wall to control my system? Q18: What is the new RadioRA 2 Select and how does it differ from the traditional RadioRA 2 system Lutron RA 2 Select uses many of the RA 2 components, the big difference is that there are no in wall wired keypads but instead Select uses the pico controllers which are battery powered and simply wall mount to a flat surface at convenient locations within the home. They send RF to the devices. Q19: Do I need a computer, software and the services of a certified programmer to set up my RadiorRA 2 Select System The beauty of RA 2 Select is that homeowners are in complete control of the system through their smart phones using the free Lutron app. There could be no additional cost to you other than the price of the equipment, you could hire an electrician to do the install or even do it yourself. RA 2 Select can handle up to 100 devices and 8000 sq ft of home, making it ideal for the majority of homes in any US State. Q20: What are the advantages of buying from Lightinghomes,com. Simply put I am an authorized Lutron distributors with over 20 years of knowledge, I have better prices, factory support and technical assistance. I want to install CFL's and LED lights, I've heard that there are challenges Dimming CFLs and LEDs with traditional Dimmers and that their performance can be a potential issue. Dimmible cfl and leds are now a standard product on all "big box" store shelves. Both types of dimmible bulbs have presented problems in the past when used with a standard dimmer and not what is called a C.L dimmer. Note: Actual performance of any cfl or led will vary from bulb type to bulb type and among different manufacturers. It is important to note that only bulbs that have been designed as dimmible should be used on a dimmer. Reduced dimming range: Incandescent/halogen bulbs will typically dim lower than cfl and led bulbs. Most dimmible cfls will dim down to 10% to 30% Early dimmable leds had the ability to dim lower than cfls and can reach levels as low as 5% to 15% The actual dimming range is dictated by the bulb’s circuitry. Lights dropping out: As cfl and led bulbs are dimmed they can turn off before the slider reaches the bottom. Referred to as “drop out,” it makes it difficult to set the dimmer at the right level without bulbs turning off. Lights not turning on: After being dimmed to a low light level and switched off, sometimes cfl or led bulbs will not turn on until the dimmer’s slider is moved up. This is referred to as “pop-on,” which is challenging in 3-way situations where lights can be turned on/off from different locations and not just from the dimmer. Lights turning off unexpectedly: Dimmible cfl and led bulbs can be influenced by line voltage fluctuations. As incandescent bulbs will sometimes dim or flicker when a device such as air-conditioning or a hair dryer is used, a dimmed cfl and led can actually turn off or flicker excessively in those situations.